Francesco Molinari, a longtime European Tour and Ryder Cup stalwart, won the British Open with a steady diet of par-level golf, using the old maxim of keeping his head while others lost theirs. He didn’t card a single hole over par after the 17th on Friday, and used two decisive birdies down the stretch on Sunday — a hammer-smash at 14 and a dagger at 18 — to hold off many of the biggest names in the game.” data-reactid=”16″ type=”text”>Francesco Molinari, a longtime European Tour and Ryder Cup stalwart, has won the British Open. He didn’t card a single hole over par after the 17th on Friday, and used two decisive birdies on Sunday to hold off many of the biggest names in the game. 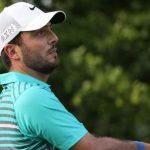 Molinari finished at 8-under, two shots clear of Justin Rose, Rory McIlroy, Kevin Kisner and Xander Schauffele. Molinari is a first-time major winner, as well as Italy’s first-ever major champion.